Nov/Dec - 2012: The Pinterest button is acting up again. 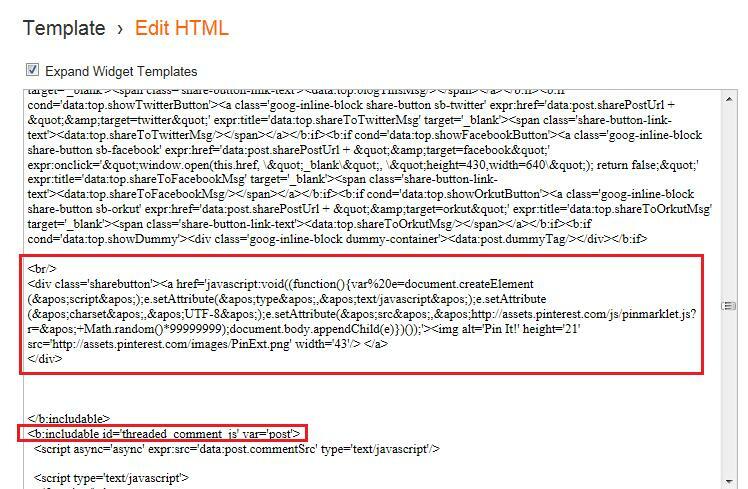 If you have trouble there is a code fix now within this post - you might find some issues since the Pinterest code doesn't work well. As you probably know, Pinterest is sweeping the world right now as yet another social networking site. It's novel approach allowing users to share interests by 'pinning' images onto grouped boards seems to have captured people's attention. You may have noticed that I've added the Pinterest button to my posts. For this site, Pinterest probably doesn't apply very well since it is focused on 'how to' content rather than more design, or image-centric activities (feel free to Pin-it anyway, if you'd like!). But, if your site is focused on hobbies, travel, photography, design, etc., then Pinterest is the social site you should be connecting to. Adding a Pinterest button to your Blogger posts is relatively simple - however, it is a direct template customization that could cause you some issues. 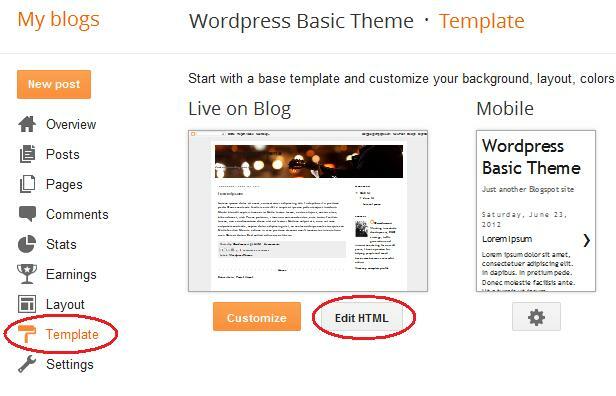 As always be sure to backup your template before making these changes (check out my post if you don't remember how - How to Backup Your Blogger Template). Oddly, the Pinterest Goodies section that allows you to create buttons is very static for sites. They have you enter your site and image URLs directly to make a button. This might be fine for a static page or site, but as bloggers we want each post to be linkable to Pinterest. Be sure to do a 'Preview' first to make sure there were no copy-paste errors. I modified the sizings so it will appear right next to the standard buttons on the left side. 'Save' your template as usual. If you read this article earlier you probably saw that I had the Pinterest button aligned with the Blogger buttons. However, Internet Explorer was giving me fits so I moved it down underneath which works better for both browsers. You can play with the size and position values or move the button by pasting the code before the standard buttons if you want or even at the top of the Post. Again, I expect Google to add this button in the near future but, for now, use this simple template code. Enjoy!! Finally a tutorial with a scrip that works! Glad it worked for you, Sandra. I really tried to get it to align with the Blogger buttons but odd problems with IE wouldn't work right. I the future I want to use or create a more colorful social network button bar. I'm not fond of Blogger's default grayed-out ones. Great tutorial. It worked well and added the 'Pin It' button to my blog posts. But, when you click on the 'Pin It' button, it opens up a blank tab in the browser instead of opening Pinterest. Any idea what might be wrong? Hmmmm.....I'm not sure why this is happening. When I click on it, I'm taken to Pinterest. Did you try different browsers to see if it might be there? Be sure to check the code you copied and pasted again too. Let me know if I can help in any way. It's not even showing up on the post for me. I would love to have it at the top under my heading with my other button and not at the bottom of the post. Thank you for working with these things. BTW I use Firefox. I was getting an error saying I must have a > or / after a with the other one. I am not getting an error with yours yet I still cant see the pin it button... I have searched and tried several different things for over 3 hours... Can y'all please, please help me with this!!! works great for me! thanks so much for this easy trick! ^^ works fine with google chrome! FINALLY!!! I have tried about 1000 tutorials, and none of them work! This is the first where the pin it button actually works!! THANK YOU!!! I'm glad it worked for you! Thanks for the comment! The Pinterest button on my blog used to work for me. But now when I click on it the Pinterest window opens but there is no picture displayed - just an empty frame. I removed my old code and added yours, but the problem remains. I started to have this issue just recently, it always used to work in the past. Do you have any idea what the issue might be? Thank you for your tip - I followed your very clear instructions and now have a "pin it" button on my new blog. However, I have the same trouble as Ms K above, and without an image it wont Pin. I've also noticed this change as well. Looks like we'll have to check the code again. Pinterest seems to have weird issues like this. Let me look into it to see if there is a solution. Thanks Don,this is much appreciated. I used another code in the meantime but now the picture gets pinned as thumbnail, which of course doesn't make sense at all. This button works correctly for me. If you have some time take a look and see if my blog works for you too. I'll have to alter this article if Pinterest keeps acting up. Whenever I remove the code I the blog preview works again. Hi Don, I found a solution that works! Thanks for finding that - sorry about the code error - I've fixed it below. I tried this one and it didn't work as well. 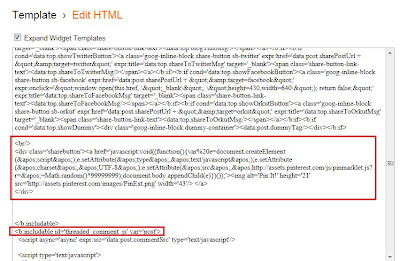 I am using Blogger and I do not have the line div class='post-header' I am trying to paste it just above where I have Plus 1, is that my problem? Thanks Don, this is working now nicely! I used a different 'Pin it' button but it all works! Much appreciated. If you have the time, do you know how to add the counter to your code, so that i displays how often a picture was pinned? Well, the counter is the problem. My example code in this Post is the counter code - but, it seems to have a problem for general images scattered within a Post. If you go to Pinterest and create a specific button specific images - the counter seems to work just fine. But, that's a ton of work unless you have specific images you really want to promote. There might be a fix out there - but I haven't had the time to hunt it down. Hi, Don. I came here after a search trying to discover why my pin it button was producing a blank image when I clicked on it. Your instructions above (to Shirley) about installing a Pin-it button underneath the post's title worked for me. However, I would like to have that pin-it button installed at the end of the post, in the same place as on your test blog, http://seo-tags-goodness.blogspot.com/. Could you please tell me how to put the button at the end of the post? Thank you. The button works, but how do I change the image from a big P to the "Pin It" button? Thank you so much! Been hunting for days for a script that would work with easy instructions. Finally did it. Thank you! The screen shots enabled me to accomplish the action after trying tutorials from several other sites and failing. Great help you provided! Glad it helped! It's been driving everyone nuts - glad there's a solution finally. Wonderful, wonderful! Thank you very much. Very thorough, detailed and easy to understand!! Sorry I replied in two different places, I should have just created my own. I have tried to duplicate the ways listed above to solve having a pin it button on my blog as well as trying to add the url under create your own in Blogger. As far as adding the script I have tried it all three ways and wither I get an error (same as listed above) or it doesn't show up. The problem I believe is I do not have the script listed to add it to. As far as adding the URL (I have also tried the url's you have listed) I get an error stating "We are sorry, this gadget appears to be broken. This gadget has errors, and cannot be used until fixed." I am sorry I have posted so much and have been such a pain... I started pasting it and seeing if and where it showed up. by doing this I have found that if I paste it just after my third '' I have it on each page even if it is not exactly where I would like it (it's not in line with all of the rest), it still is just below my search and just before the blog title... It works.. I took a look at your blog and see that you're close - almost there. 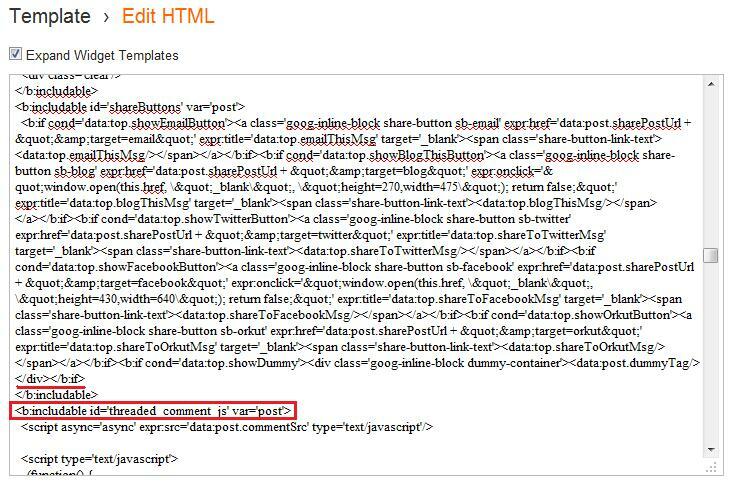 It seems you're pasting the code in the wrong spot. Your Pinterest button works - just needs to get to the right spot. 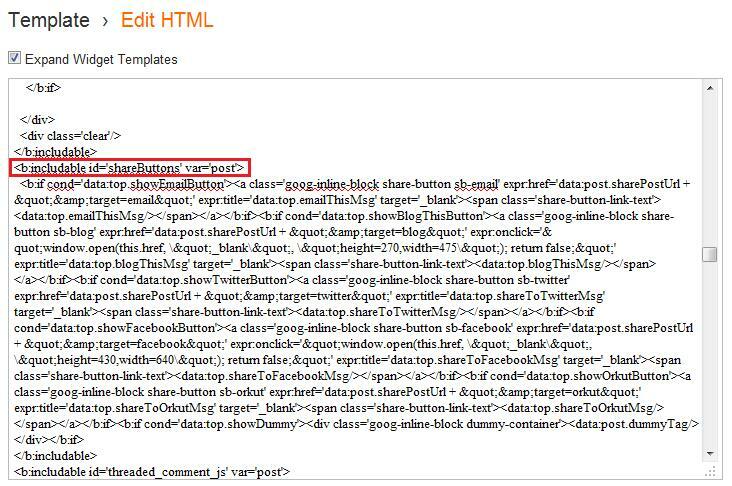 The new Blogger template editor is a bit more tricky than it used to be. 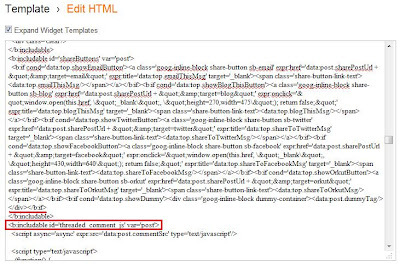 You need to expand all of the template code to find the line above where you need to paste it. To expand the template you must click on the little black triangles on the left (take a look at my latest post to show you what I mean). 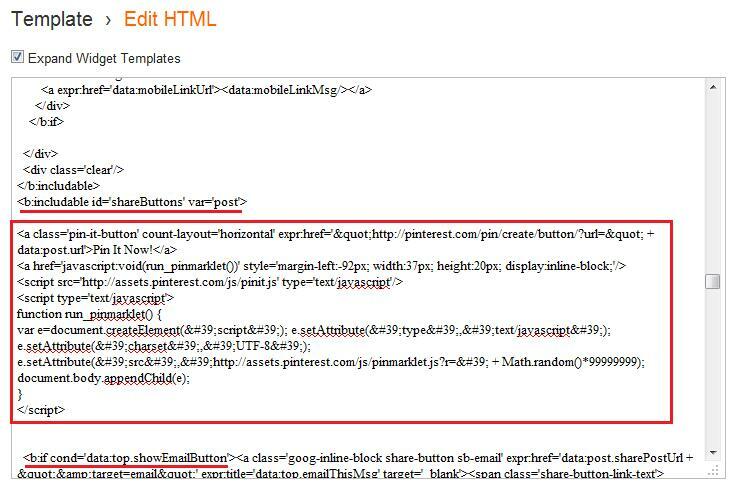 and paste your Pinterest code as noted in the tutorial above. I hope that helps - templates are difficult to manage directly.